You saw a sneak peek when I posted our spring home tour, but the dining room makeover is finally finished! Last year I posted phase one of the makeover, and there was still plenty to be done after that. It’s been slowly evolving since then. It’s hard to believe that it’s even the same room! 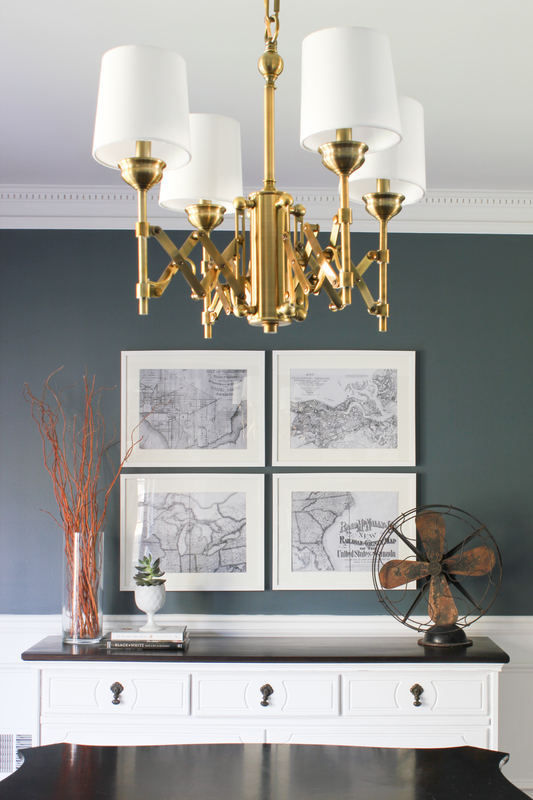 The number one question I get asked on social media about this room is about the paint color. 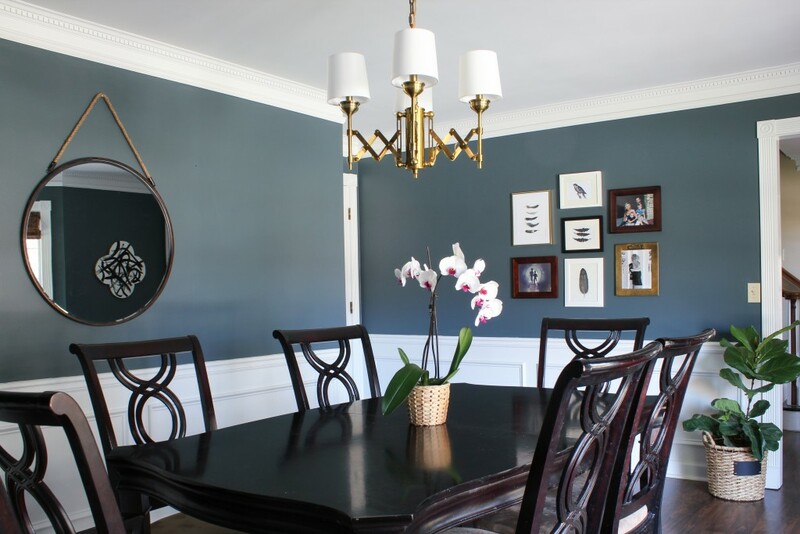 It is “Nocturnal Gray” by Benjamin Moore, and it’s sort of a blue/gray/green color. In some lights it appears navy, other times it’s more of a dark blue/gray, and sometimes it even shows a hint of teal. It really depends on the lighting, and I really love that it changes depending on the time of day. I picked up some frames at IKEA and added a few maps. I downloaded the maps from the Library of Congress (they’re too old to have copyright protection), and had engineering prints made at Staples. (These are only $1.99 each for an 18″x24″ size, which I cut down to fit the frames.) I chose places that have meaning to us. Washington, DC is where we met; Charleston, SC, is where we went on our honeymoon and is also one of our favorite cities to visit; and I attempted to find maps of Indiana and North Carolina (our home states) that would fit these frames and I haven’t been able to find the right ones yet. In the meantime, I had an extra large engineering print of a U.S. map made and cut parts of it to fit in each frame. I’ll be replacing these two eventually. I bought the antique fan at a local shop called Canton Street Antique Market in Roswell, GA, a couple years ago during an Atlanta bloggers meetup. The dresser was a Craigslist find I refinished a few years ago. I’ll be posting more about the new chandelier very soon, so keep an eye out for that. There wasn’t anything wrong with the old chandelier, it simply wasn’t the style I wanted for this particular room. I haven’t ruled out moving it elsewhere, or possibly spray painting it in a different finish and using it in another room. Not sure yet. 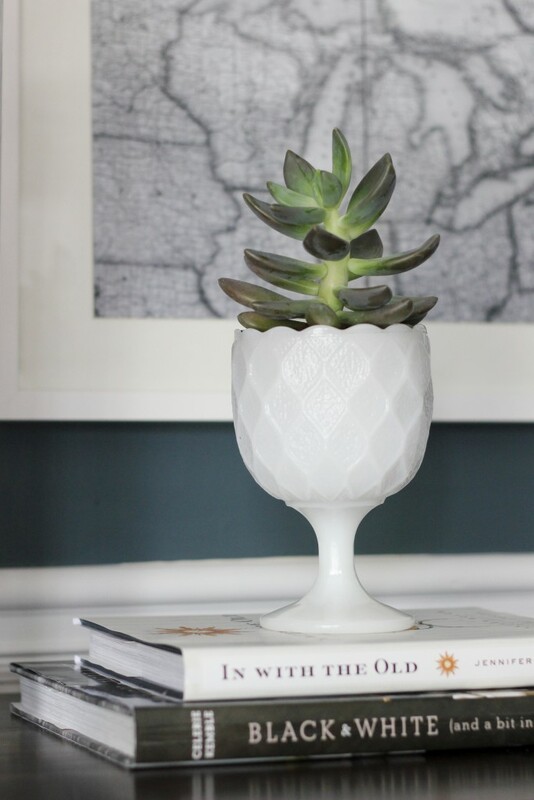 The table came from Z Gallerie several years ago and I plan on building a farmhouse style table at some point to replace it. The table is not solid wood and we often have to tighten the screws because it gets wobbly, and I really just want something more solid and higher quality. Ignore all of the knicks and scratches, and the seats desperately need to be recovered because, well, kids. 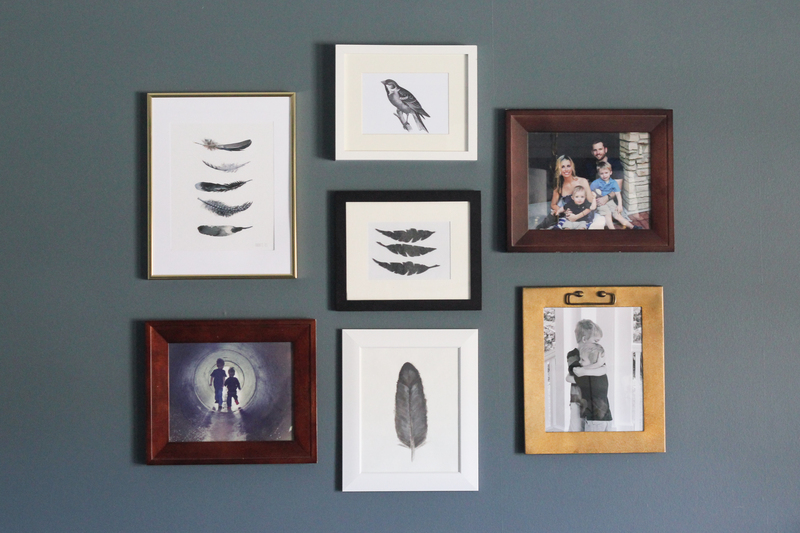 I created a gallery wall with family photos, a free bird graphic I downloaded from The Graphics Fairy, a feather print I ordered from Etsy, some felt feathers I made with my Sizzix machine, and a watercolor feather I painted. I also made the abstract quatrefoil art. 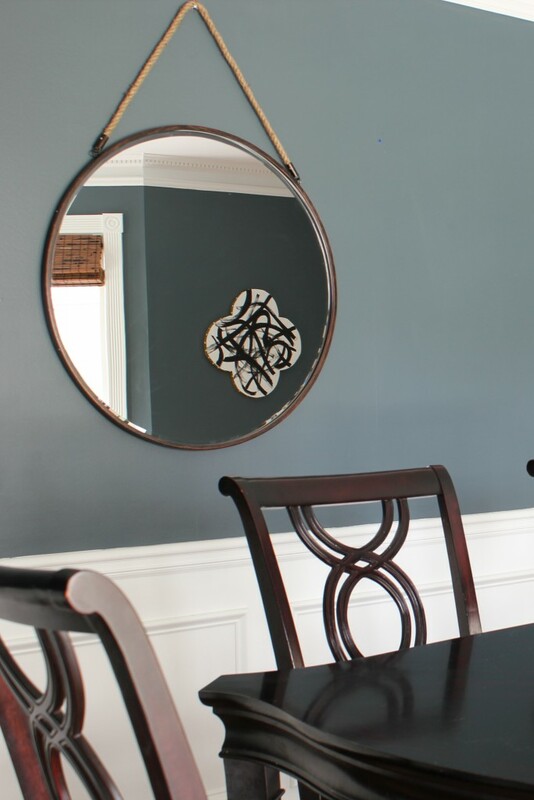 The round mirror came from Kirkland’s. And you guys, I’ve actually kept a few plants alive! I can’t even believe it. Two fiddle leaf figs and a handful of succulents are still alive, and the orchid but I’ve only had it for a couple of weeks so I haven’t really had time to kill it yet. Maybe my black thumb is turning brownish green! 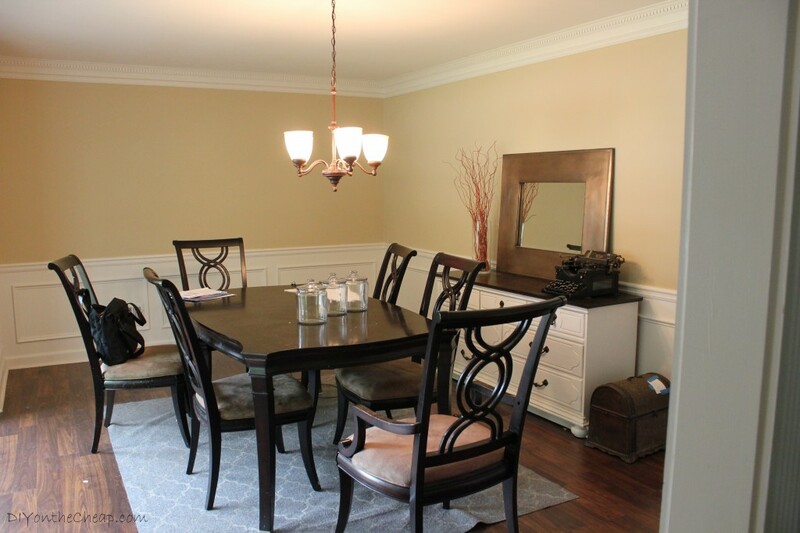 If you’re a fan of the new dining room, I’d love it if you would share it on social media! 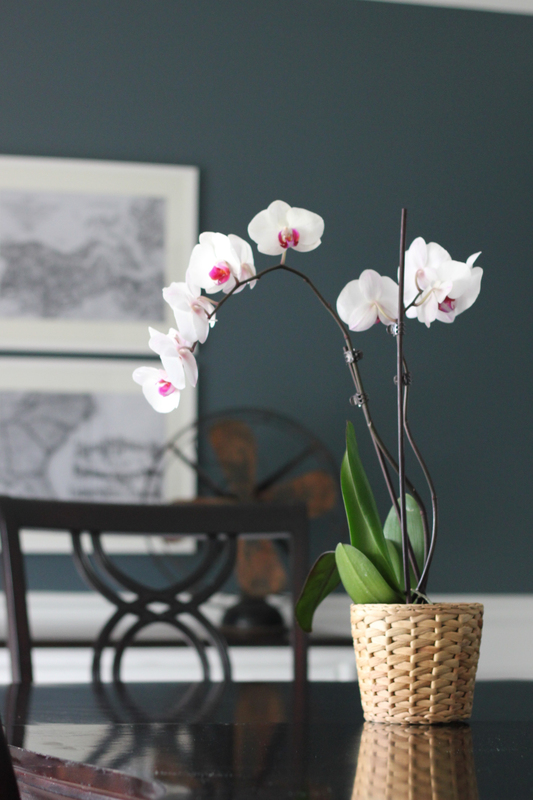 Have you made over any rooms lately? I would love to hear about it! Stunning. Love the new color and all of your accessories are perfect. That chandy is gorgeous. You did such a fabulous job with your makeover. Thank you so much Marty! I appreciate that! 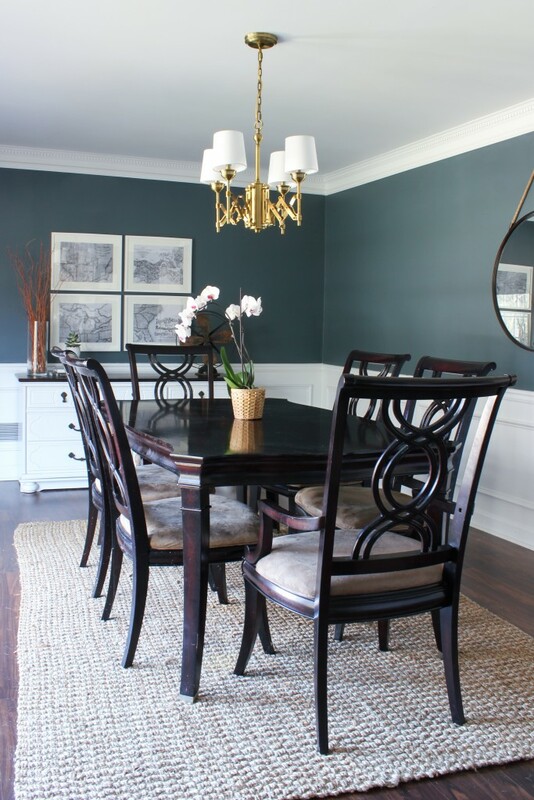 Not only is that deep teal completely jaw dropping, it brings out the beauty of your amazing dining set! I’m not going to lie this isn’t a color I see everywhere so I’m very intrigued. Lots of people play it safe with browns and grey. But this is just stunning. Awesome job! eagerly awaiting info on that light. i think it’d be perfect for my parents dining room. Still staying traditional, but adding a little flair! Thanks Erin! I’ll be posting about the chandelier next Thursday! Erin- it looks amazing. I love all your art choices. such a pretty space. enjoy it. It’s GORGEOUS! I love the color, and the sentimentality behind the art. Hi! i love this. i’m wondering if you can share more information about how you had those map engineering prints made (what format you downloaded the maps in, etc.). thank you! Great idea for a blog post! I will try to post something about it soon. In the meantime, I downloaded high-res jpegs from the Library of Congress site. Some of their maps are not high enough resolution to do the enlargement, but when you upload them to order the prints it will tell you whether or not the resolution is high enough. Hope this helps! I love everything in this room. I have a question about your fiddle leaf fig trees (mine are dying)? How much water do you give them and how often? Thanks in advance!!! Thank you Janice! My larger one isn’t looking so hot at the moment. I usually water them once a week. I just add enough to let it drain out the bottom and then make sure to blot up any standing water so they don’t get root rot. My large one usually gets maybe 2-3 cups of water per week. The smaller one shown here gets maybe 1-2 cups per week. I’m no expert though! I know they are finicky and don’t like to be bothered or moved around much.